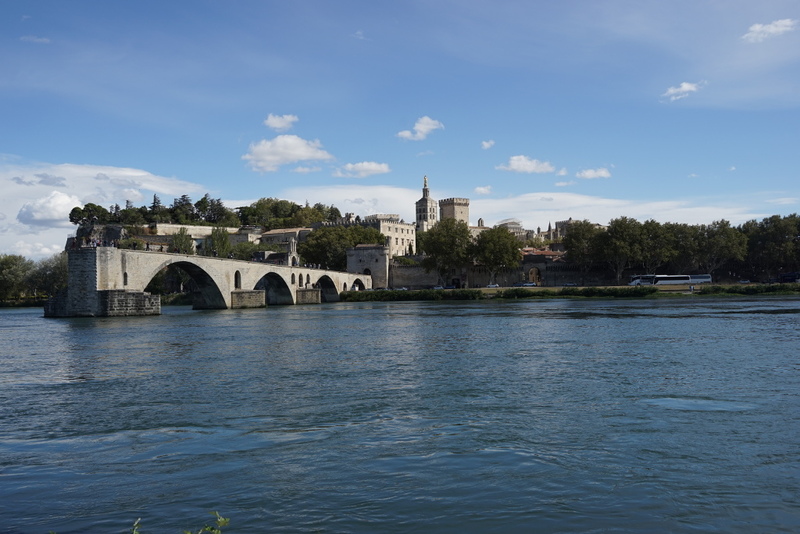 We are now in Avignon. This was not part of the plan, if there is ever any plan about anything. The cupboards are running bare so we were going to stop at the Leclerc supermarket on the outskirts of Apt, but it was mobbed. The GPS kept wanting to take us back there, so we carried on clueless until we eventually found ourselves on the outskirts of Avignon, where we stopped and programmed in a local campsite. It has been a few years since we were last here, but the local enterpreuners were still manning the traffic lights going into town trying to wash your windscreen and demanding money with menace. All smiley at first, until you don’t pay, or tell them to go away (in anglo-saxon). If they were homeless types desperate for a meal, or students wanting some beer money, fair enough, but these are clean, well dressed and well groomed people just seemingly out to harass people for cash. Annoying. Anyway, got to campsite, went for a stroll, and will explore further during the next few days. This entry was posted in France - Autumn 2017 on September 19, 2017 by Kenny Mitchell.